HOT DEALS: Further Blu-ray and DVD reductions in the HMV sale | What Hi-Fi? Deals include the Bladerunner, Final Cut: Ultimate Collection for £5.99, the Godfather Trilogy for £12.99, Rocky: Complete Saga for £9.99 and Star Wars: Prequel Trilogy for £14.99. Individual DVD films in the sale include Slumdog Millionaire for just £3.99, Monsters vs Aliens for £4.99, Watchmen: 2 DVD Special for £6.99 and Quantum of Solace: 2 DVD Special for £4.99. And if you want to boost your Blu-ray collection how about the Band of Brothers boxset for £17.99, Leon: Director's Cut for £7.49, Batman Begins for £10.99 (or Dark Knight at £12.99) and the BBC's Earth for £6.99? 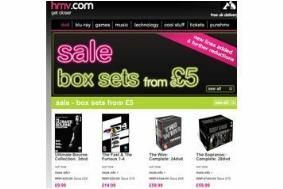 For these and many more offers visit the HMV website.